I’m in the process of reading for review the Superversive Press anthology To Be Men: Stories Celebrating Masculinity. I plan on writing both an Amazon review and a much more detailed one on this blog when I finish. But I can’t wait. I’m going to create a wee preview highlighting one of the short stories enshrined therein. But first things first. Why an anthology about “celebrating masculinity” when so much of what has been traditionally defined as masculine (for good or for ill) has been deemed toxic, not the least of which by third wave feminists and progressives? Tired of stories about men as bumbling idiots? Of fathers as incompetents? Of masculinity as “toxic”? Tired of misandry? Ready for some real masculine role models? Stories about heroes and men who do the right thing? Stories about real men? The kind that provide for their families, love their wives and children, and make sacrifices. And save the world. 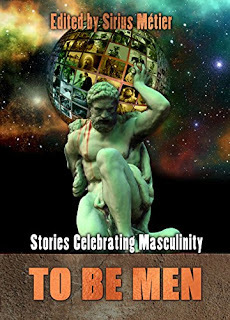 A collection of seventeen stories and two essays, To Be Men: Stories Celebrating Masculinity pays homage to men and masculinity. Fun. Action-packed. Thought-provoking. Whatever your tastes, you will find enjoyment in these pages. In other words, as I wrote about here almost a year ago, Not All #menaretrash. I chose this one to preview because, over the last few years, I’ve reached out to several of the Superversive authors, and Richard is one of those who has been gracious enough to engage me on both his blog and mine. He’s also currently living in my hometown of Omaha, Nebraska, and even though I don’t believe he was born a midlander, we Nebraska guys have got to stick together. Oh, “To Be Men” was published just about five weeks ago, and out of the six Amazon reviews so far, all of them are five stars. Pretty impressive. About me as a reviewer. I can like you. I can like you a lot. I will still do as fair a review of your story or book as my sense of impartiality allows. It’s nothing personal. Even if I found a few flaws in your work, I still really like you. For instance, I’ve reviewed a number of stories and novels written by Irish mystery author Aidan Reid, and although I like him and his work and think he’s getting better all the time, he’s only gotten four stars out of me so far. He told me once, he continues to seek that fifth star, and perhaps his upcoming sequel to Sigil will win the day. Spoiler Alert: I’m going to spill my guts about “The Last Hunt,” so if you don’t want to know, stop reading now. Remember, you have been warned. First of all, it was shorter than the other stories I’ve read thus far, which surprised me, especially given the topic and plot, which I think could have been developed a lot more than it was. Second, there were a lot of questions about a very complex dynamic that probably should have been addressed and would have added to the overall reality of the universe Richard created. Here’s the deal. Based on the world as we know it, and Hillary Clinton labeling a good portion of the United States’ population as deplorables, I think a lot of us get a sense that there is a growing divide between the urban and rural areas of our country, especially in terms of politics, values, ethics, morals, and religion. I don’t think it’s a total “black and white” dichotomy, but at least in the news and social media, it certainly seems to be approaching that. Richard created a world in which that dichotomy reached a vicious tipping point, prompting the mega-metropolitan areas of North America (Canada, the United States, and Mexico), and ultimately the entire populated world, to literally isolate themselves from the rest of the nation or “flyover country” by building forty-foot tall walls around their cities topped by razor wire. Then they sealed off all of the access points. The mega-cities are connected by an underground series of hyperloop trains which cannot be accessed except inside mega-city walls. Somehow, food, fresh water, and other supplies are shipped in, but it’s never made clear how. Anyway, the metropolitan people are happy for the most part, and so are the people in rural America, and it seems like some sort of balance has been reached. Really, there are now two Americas based on residence, value systems, and socioeconomic class. This raises a ton of questions, but it’s not really main part of the story line. At some point, a deadly plague develops in the mega-cities and is carried to all of them by the hyperloop system. Worldwide, the cities are all dead of dying. Fortunately for the rural population, the city walls serve not only to keep them out (and few if any rurals want to get in), but to seal the disease in. There is no cure. Soon, the entire human population of the planet will live only in the free air of the rural landscapes, in small towns, and on farms and ranches. But one hundred people escape from the cities in the U.S. and eight Hunters are assigned to track and eliminate them in order to keep them from infecting millions more. The story is told from the point of view of one of the Hunters. We never learn his name. He has killed seven men and four women. Between him and the other seven Hunters, they have killed all of the one hundred…except for one. We learn that he is a farmer and longs to have this grisly but necessary task done so he can go home to his wife, his children, and his farm. The Hunter waits at a lake for his prey, since it represents the only clean drinking water within miles, and finally the last infected person shows up…and the Hunter kills him, just like that. After a 72 hour waiting period to make sure he wasn’t accidentally infected, the job is done and the Hunter goes home. End of story. Please understand that any criticism I have is based how this interesting concept could have, and probably should have, been expanded. For example, how did these people from urban environments manage to survive in the wilderness? They (probably) can’t hunt or trap, so where did they get their food? What about shelter? Did any of them try to approach a town or small city (which would have meant disaster, but it would have been the logical thing for these people to do)? Also, if the plague is invariably fatal, wouldn’t all of the one hundred have eventually died off? And I would have loved to see some sort of conversation/confrontation between the Hunter and the last infected person, including some angst at killing him, having gotten to know the urban escapee as a human being. These are only a few of my questions. I live in a small suburb near Boise, Idaho. Mid-sized cities wouldn’t have been absorbed in huge mega-city complexes, so what happened to them? Really, there’s a whole series that could be created out of Richard’s concept. Now here’s the real kicker, and why I like this story so much. It mirrors what’s happening right now in San Francisco, and what is likely to happen to New York and other urban centers in the near future. By enacting laws and policies that are designed to assist the homeless, but in fact have resulted in rampant drug abuse, used hypodermic needles littering the streets along, with piles of human feces, I can see a future where all of these metropolitan areas really do drown in disease and filth, walled in or no. I’ve lived and worked in rural America and know too much about it to believe it is a paradise. They have ignorance, poverty, drug abuse, and a world of other ills, at least some of them. I also know that Big Agra and the GMO pushers are the ones who actually feed the cities, not the “Mom and Pop” farms the Hunter represents. All that said, I think the physical as well as philosophical schism between rurals and urbans is something that was only touched upon by Richard. I hope he decides to expand on his creation in the future. It deserves a much wider universe for us to explore. It does sound like an interesting storyline. I’ve tried to live rurally, and was totally ripped off (changed my view of the world pretty radically, not only about rural America… it didn’t occur to me to think of it that way then). I’ve been living suburban (actually, it’s kind of a big city itself), most recently, which I have most of my life too both growing up and while my children were very young. In this setting, I wouldn’t have expected it at all but we encountered the racism I told you about in a recent thread (involving resentment against people from India and other Asian countries). It’s not everyone who are that way. Just want to mention, while I’m at it here, that some specialty stores and restaurants in cities (in the context of current matters) get significant supplies from mom and pop and other relatively small farming operations. I worked in such a store, a small one, decades ago. The ones around here now are larger than the one elsewhere back then. But it is the case that most food for everyone comes via “Big Agra” and GMO monopolists and so forth. Nevertheless, eight hunters with more personal points of view could be roused. Yet… would they find it safe to leave their properties unattended for any period of time? Yes, NYC has actually less homogenized groceries than the suburban stores I’ve been in. They cater to local tastes, even those with more than one branch. We don’t have the big chains (and many people complain about it). And we have local Greenmarkets with farmers from upstate, even in the largely working class Hispanic neighborhoods I’ve been living in. I have relatives in rural Ohio, and they have a much worse drug abuse/homeless/crime problem where they live than we have here. People are making an artificial division about these problems…they are everywhere–city, suburb, country. That said, it sounds like a good idea for a story. I don’t know about the walls, but the sundering has happened before in our history, and could definitely occur again. Thank you, James, for a good, fair review, which is all anyone could – and should – ask for. Your point about it being a very short, short story is valid and was noted by the editor when I submitted it. But we both agreed that the story made the point it was intended to make: Namely, there is a prevailing attitude among the denizens of the big cities to look down upon “flyover country” and those that live there. I witnessed this first hand during my brief stay in San Francisco a few years back. I kept this story short so that the point I wanted to drive home would not get lost in all of the other details. That if the “big” cities try to cut themselves off from the rural areas (CalExit for example) it would be to their detriment in the long run. On the other hand, I very much doubt the rural areas would miss the big cities all that much and would be more able to survive without them. I honestly don’t see the big cities making it should they isolate themselves in the manner seen in “The Last Hunt”. As far as expanding on this story at a later time – I might just do that. If I ever get caught up with all of the other projects piled up on my plate, of course. Thank you again for reading my story, and the anthology, and for the review. Thanks for commenting Richard. For some reason, your post was flagged as spam, but fortunately, I check my spam filter regularly and “liberated” it. I did mention in my review that there are a lot of mid-sized cities such as Boise and the surrounding area that might not fit the dichotomy, especially since Idaho is a pretty red state. Your scenario might have “worked” a little better if the big cities had included some land upon which to farm, and the rural areas included more mid-sized towns and cities. That way, the metropolitan areas would be more self-sustaining. Just my opinion, of course. It’s how my brain works. I find it difficult to envision such a dichotomy, because of the systemic interdependence between rural and urban environments. I have lived my entire life in suburban environments, it seems, even though I grew up technically within the boundaries of a large city (Philadelphia, PA). Even there, my home was near the outskirts, and the environment was virtually suburban. I’ve always been aware of products and services coming to and from both (or all three) sectors. Even living in Israel, it seems I’ve always lived in a town not far from a major metropolitan center and bordered by farms. I learned where I might find a given product or service (including employment) in one or another sector without traveling any farther than necessary. I find a great deal of normalcy, if not outright necessity, in such integration — politics be damned. I agree that in real life, this situation would be unlikely to happen, but as symbolism, it’s certainly interesting. The story was seeded by some comments heard while living in San Francisco. More than one denizen of that city have stated that water should be denied to farmers in the Central Valley of California because they are just wasting it. Think about that: Growing food is a waste of water. When asked where they thought their produce was coming from and what would happen to both supply and pricing if these farms were cut off from water, they just assumed the food would be provided from other countries. But what if those supplies were cut off? There is also an attitude that if you don’t live in “The City” you are trash. A backwater idiot and unable to understand their “truths” about how life is. A person I know was thinking of opening a coffee shop in San Francisco (which seems to have at least two on every block) When I suggested they consider opening a store in one of the city in the Valley (Modesto, Fresno, Stockton) they laughed. “Those people wouldn’t understand the concept of my store.” Direct quote. This is the prevailing attitude in San Franscisco I might add. Allowed to spread, I feel we could indeed see a future where the big cities take steps to seal themselves away from the “hicks out in flyover country” that these city people seem to enjoy sneering at.